Several characteristic features of contemporary conflicts (wars) were displayed and basic ways of use of unmanned aerial vehicles were revealed in the article, such as air system components for reconnaissance, communication, and navigation and attack systems. the possibility of troops (different groups) to carry out non-contact combat actions by the use of a single info-communicative space (ICS). Thus, some modern and future wars will become high tech ones and first and foremost, "network" ones, so, those ones where the troops will use new weapons for various purposes (including unmanned aerial vehicles), the application of which will be based on information priority that enables to control troops and combat means more effectively, and to have full awareness of the enemy actions. Therefore, disclosure of the main uses of unmanned aerial vehicles (UAV) likeair components of the future weapons in modern warfare, which will form the basis of intelligence, communications, navigation and attack systems, and they are very important. Analysis of the literature. In the literature the specific features of modern wars and the creation of modern troops and weapons were examined, including UAV for various purposes but consider issues on development of directions of their use as components of air to create CP to ensure information superiority over the enemy was not developed. The target of this article is to determine the future approaches to development in the use of drones as aerial components of intelligence, communications, navigation and attack systems in modern warfare. 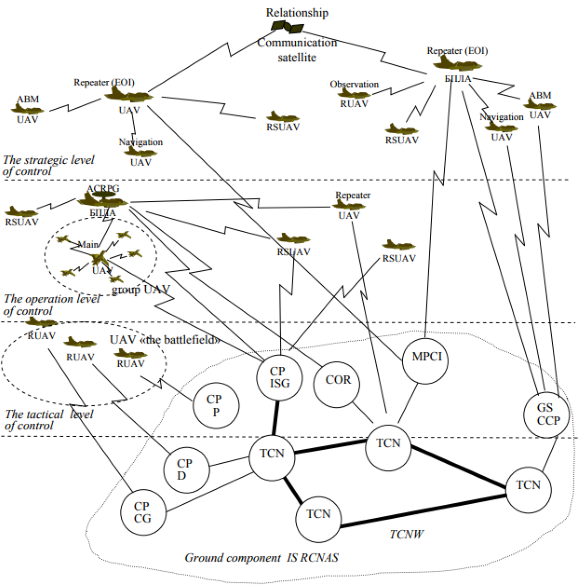 During the wars (conflicts) that are of informative nature and became net-centric ones, the crucial in achieving goals is not an advantage in number of troops or weapons, but the ability of commanders (command) to use simultaneously all available forces and means of fighting in real time based on a single plot of command, through the use of UAV for various purposes. cruise missiles (designed to destroy any objects of land, air and sea-deployment. Reconnaissance UAV (RUAV) are characterized by long range and time of flight, high altitude of flight and its speed. They are composed of a wide range of means of communication and reconnaissance equipment. They perform complex tasks in the exploration of a certain territory. Reconnaissance and impact UAV (RSUAV) are characterized by a medium range level, the time duration and altitude of flight, but they have high speed. They have a significant amount of reconnaissance equipment, communications and weapons (often missiles) and perform several tasks depending on the circumstances. UAV "the battlefield" are characterized by a relatively small distance, height, speed and flight time. They include the reconnaissance equipment and data transmission equipment of minor amounts and perform specific tasks (often single ones). Cruise missiles (CM) are characterized by a range of actions towards targets and speed of flight. Hypersonic ones – the average flight speed is more than 5M, with flight range of 100-500 km, subsonic missiles, long-range over 1000 km, subsonic missiles, mediumrange up to 1000 km, the low subsonic missile flight range – less than 300 km. in case of long term preservation of the UAV, it does not require any training of the pilot and expances for activation and preparation for departure, in addition to this UAV has much less operating expenses and does not require large airfields and infrastructure. Thus, it is possible to note that the role of the UAV to provide capture and keeping of the information superiority over the enemy in the future will grow considerately, and this requires determination of directions of their further development for application in modern operations. usage as information and intelligence element in ensuring the organization of search and rescue operations to find and evacuate the crews of the planes that were shot down over enemy territory. Integrated use of UAV of different classes as a highly mobile component of Air forces of Armed Forces of Ukraine should provide: in a very short time, the gathering of intelligence about the enemy over a large territory in the zone of combat operations and in great depth in its territory; implementation of target identification for the application of precision weapons and strikes on various enemy targets, including themselves, in case of identifying important goals (objects) of the enemy; effective action group by different UAV with different types of planes under the conditions of opposition of air defense of the enemy; use them as aircraft decoys with the goal of increasing the survivability of aviation strike complexes in the tasks of combating fire tools and suppression of air defense of the enemy. In future, with the aim of navigation support of the aircraft to perform various tasks, you need to use domestic UAV, to create a regional domestic navigation system as an alternative satellite navigation system ASNS (GPS) that is under full international control. That is, the manufacturer may at any time deprive users of access to the navigation information (especially in the context of deteriorating relations between certain countries, or in case of conflict). Domestic navigation system that will be used instead of navigation satellites, the UAV will have significantly lower costs of deployment and operation, and its operation will not be affected by political, economic or military issues or the situation of foreign States in relation to Ukraine. The use of UAV as aircraft systems, radar detection and guidance, as the elements of air control points, which solve problems of conducting radar reconnaissance, detection of air and ground (sea) targets of the enemy and aiming them high-precision weapons, allows synchronized use of various aircraft types of aircraft and UAV for different purposes and their functioning with the ground (ship) information systems and means of destruction in a single reconnaissance-strike system of interspecific grouping of troops. The use of UAV as relays of information and communication nodes, allowing you to control a group of UAV (aircraft) as at considerable distances from the control points and at low altitudes due to the transmission of commands and information through them, as an intermediate instance between the control room and the main UAV (aircraft). Fig. 1 shows the possible use of UAV as elements of the airborne component of the integrated system of reconnaissance, communications, navigation and attack systems (IS RCNAS) for relevant levels of management in the conduct mariesantini wars. This information with MPCI is issued to the interested users via telecommunications nodes (TCN) of telecommunications network (TCNW) within their authority to appropriate control points (CP) (for example, command and administration of the General staff (GS) of the (Central command post (CCP)), ISG and other parts) to plan the usage of their forces and means. In case of detection by the UAV of the threatening or very important target (object) there may be the destruction by the other strike (or reconnaissancestrike) UAV according to the operator's instruction with the appropriate control. In addition, this level is based on the use of UAV to implement navigation support, search and rescue crews that were shot down above enemy territory and functioning of the elements of a missile defense system in the interests of the state. At the operational level of command and control the tasks of different UAV are carried out in one of the operational areas (sectors) of warfare. Control of the UAV is performed with CP. the UAV performs tasks: ground targets attack (including small moving targets); jamming radar and communications equipment and automated network management systems of the enemy; conducting a complex aerial reconnaissance; determination of coordinates of targets and the implementation by target-indicating systems of fire destruction; providing communication and information nodes of air components. As information nodes, aerial UAV components are used, which function is like aviation complex of radar patrol and guidance (AC RPG). UAV control a single UAV and their groups, and it also realizes transmission of intelligence information not only on CP but also the centers of intelligence (COR), and to other users (MPCI, CP parts (units of tactical level). At the tactical level of command and control means are used to perform tasks in most single UAV "the battlefield" for various purposes in the implementation of information support of actions of the relevant units and tactical level. As a rule, such is CA UAV (operators) of different parts (divisions) and combat groups (CAP (D, CG). The obtained intelligence information is transmitted from CA tactical field to COR than to GCOR through TCN to appropriate changes in the database to implement a continuous and complete control over the development of the situation in the zone of combat action and consideration change when implementing planned use of forces and means of tactical level and higher management levels. Thus, drones of various levels of management and functional purpose in their entirety take part in the formation and usage of information intelligence-combat space. The change of certain types of weapons and special equipment, the use of advanced information technologies and methods of application of forces and firepower troops in modern wars shows that they gradually become net-centric ones, where the main task is to gain information superiority over the enemy. In such circumstances, the role of UAV in the future will only grow, and the development of the theory of their use in determining new directions for their usage will gain importance in the struggle to win the information superiority over the enemy by creating an integrated system of intelligence, control, navigation and communication (where they will be used as the main information and percussive elements). The functioning of such integrated system will ensure the use of information reconnaissance and battle space in the area of warfare as governments at all levels and all elements net-centric system (various combat means, information systems and complexes, troops, military groups and the military on the battlefield).